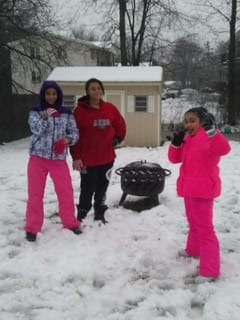 “For the first snow of the season Daleyssa and Juleissa Perez are warm and pretty in pink thanks to Warm the Children program. The girls and their mom shopped with Blasdell Elementary teacher and volunteer shopper Carrie Anderson earlier this month, just in time for the cold weather”. Currently, 346 youngsters from 136 families in the southtowns have been provided new, warm winter clothing as a result of generous contributions to Warm the Children. Special thanks are extended to the following organizations and businesses for making a major gift to Warm the Children: Baille Lumber, Louise K. Mokadam Family Trust, Hamburg Chamber of Commerce Annual Golf Tournament, Hamburg Women’s Golf Tournament, Zonta Club of Hamburg and Orchard Park, Hamburg Music Festival, Hamburg Retirees, Ferrous Manufacturing and Evenhouse Printing. While contributions in any amount are gratefully accepted, Rotary hopes individuals, businesses and organizations will consider sponsoring a child by donating $75, $125 or $150, which buys clothing for children ages birth to four, five to 14 and 15-18, respectively. Checks payable to Warm the Children Fund may be dropped off or mailed to Evans Bank, 5999 S. Park Ave., Hamburg, NY 14075. Or donate online: www.hamburgrotaryclub.org/SitePage/warm-the-children.